I always enlarge patterns on my copy machine at home. 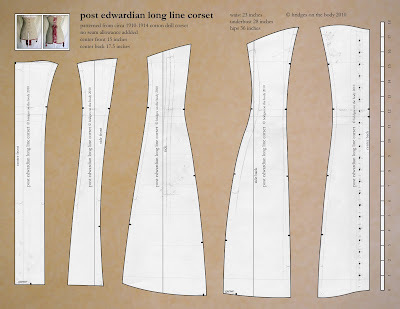 First, copy the page from Corsets and Crinolines, if you are using the post edwardian pattern you just need to drag it to your desk top then print it out. Once that's done enlarge that copy (or printout) 200%. I enlarge the corner with the scale first, and once it is the correct size I copy the whole pattern, rotating and rearranging the page until the entire pattern is enlarged. This percentage can be a bit different for each copier, but mine was 195% so that should give you a good starting point. Then start puzzling the pieces together. If you use a window as a light box you can slide the pages right in place. When you have all the pieces together you should have something that looks like this. Tape the pieces together then mark the waistline, which is right between the two dashed lines, (this is already marked on the post edwardian), and measure across. Did you get approximately 10 1/4 inches? I did. Double that number to figure what the total waistline will be. My guess is we'll all be altering this pattern to be larger. You may be wondering, why not just copy the pattern from the get go at 400%, assemble the pieces, measure across the waist and be done with it. It will be close enough since alterations will be made anyway, right? Yes it will. I just like precision and that precision starts with enlarging the pattern to the correct size. Later this week we'll take our measurements so next week can officially start the sew along! I've heard it explained how to enlarge a pattern using photoshop, but I've never done it. I'm sure for those familiar with the program It's a quick method, I'll have to figure it out and use it sometime. Hello, I've been following your blog since last year, and his works always amaze me. But with this corset I have a question (half idiot) that don't want silence ... being this corset longer than its predecessors, as the ladies were to go to the toilet???? had to withdraw the corset? Hugs and get the stuff I'll try do this corset, although already changed the measurements to make one for the Barbie doll. Not an idiotic question at all Arteira. Neither the busk nor the boning extend to the bottom edge of the corset, so the fabric below the hips moves allowing the wearer to sit and take care of necessities. The method for pattern alterations on computer that works the best for me is using Inkscape or Illustrator. I import the scanned picture, manually trace it to a vector, then resize it to the length of busk I want to use and make the changes. After that I make a pdf and print that tiling the pages. Thank you Jo for me elucidate the question. Can you just confirm, looking at both the patterns, the Norah Waugh pattern seems to have less boning, only 8 1/4" flat steels, not the 12 specified. I see the Edwardian pattern uses 12 of these. I may buy a continous role of wire but just good to know the exact requirements, and I assume the same length will be used in both styles? That is a clever technique Ico-Anubis! Merineiti, enlarging with a grid works quite well too. Hooray for analog! You're right Inhalo Corsets, there are less bones in the Norah Waugh pattern. The supply list was generated from the post Edwardian pattern, which contained more bones. I've had a problem enlarging the post edwardian and I don't know what I'm doing wrong. When I enlarge the scale to measure an inch, which was about 260% in my printer, it seems as though the scale starts to slip off around the 3 inch mark, so by the beginning of inch 4 it is off by almost 1/16 inch and by about the 12 inch mark it is off by almost 1/4 inch. However, when I measure the inches individually (ex. 1-2 2-3 3-4, etc), they are correct. Any idea what is going on here? Is it safe to assume that the next step will be cutting the pattern out? I'm so excited to get started! Those fractions of an inch can really add up can't they? Maybe scale up a bit less, say 255% and see if that helps the overall measurement. Otherwise, just assemble the pieces as best you can, all the lines will be smoothed out when we start drafting. I hope this helps! Brassandlace, we'll have the patterns altered and cut out by the end of next week! I ran across your site a month or two ago and I wish I would have checked back sooner. What a wonderful project! I really want to learn how to make corsets. 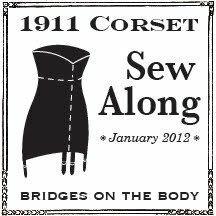 I'm only a beginner at sewing, but corsets and period clothing are very interesting to me. I will be following along, even if I cannot participate this time. I hope you will do other sew alongs in the future. Thanks Jo, it does, and I'll do that then. I don't mind at all. I can't wait to read your tutorial! I'm a little late to the party, hoping to play catch up. Back from Office Depot, their copy machines required a 278% enlargement to get to scale. Happy to have you with us! Thank you Jo! I've been meaning to ask about flat lining. When you use this term, do you mean that you treat the two layers as one? The reason I ask is that I'm considering it. I have black coutil and some red silk brocade that I would like to use. You and I are on the same page! I asked a similar question a day or two ago on another thread. I've been doing some searching, but still can't quite figure out what exactly flat lining is. Flat lining is exactly that, using two layers as one. I usually hold the layers together with basting spray and cut as one piece. Basting spray. Clever. I did not know such a thing existed (I am rather new to sewing). Do you have a particular brand you have had good experiences with? Reviews seem to be all over the place. I use Sullivans "The Original" Quilt Basting Spray. It is a temporary bond and is repositionable. It gets the job I need it to do done.